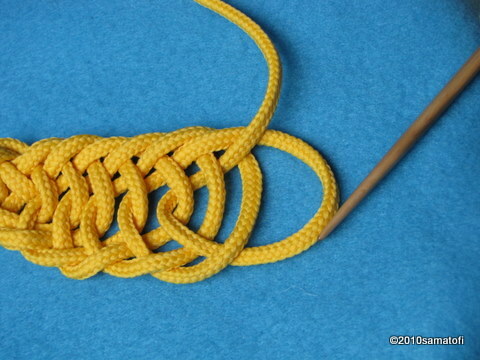 Video (linki) - includes how to start and make the first loops; joining a chain of stitches to a circle; second row and connection stitches (F1/F2); using thin yarn and tensioning the stitches onto the needle; how to make a round start; voiceover both in English and Finnish. - includes only the stitch itself. 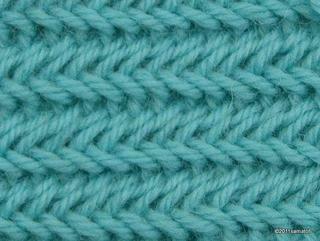 In Finland this stitch type has been used at least in Savitaipale (Kaukonen, 1960), for thin church mittens. In the NBA ethnological collections there's also a sample made with stitch, 9616:6. An older find is from Kaukola Kekomäki (from Carelian Isthmus; area belongs to Russian since 1940), (photo; page 27, photo 12) two pieces in striped, three-coloured nalbinding (about 1200 CE) in which the stitch is the Finnish Stitch 1+2, but the connection stitch is different (M1). A man's grave was found in 1868 in Denmark, at Mammen (link). The man was buried in winter 970-971 CE, wearing expensive costume, with decorations including among other things tablet woven bands, and nalbinding with silver and gold threads. In the original Danish website word 'nålebinding' (nalbinding) is used, but in the English version they use word 'crocheting'. This stitch was used in Egypt already about 400-600 CE (photo1, photo2 at the bottom of the page, click larger, photo3 + diagrams 12-14 (illustrated from the reverse side). A pair of mittens from Schleswig (Germany) from 14th-16th century (photo).